12 weeks of training. Over $500 spent on race fees, runners, a pair of compression socks ($15! for socks! ), and pre-workout, mid-workout, and post-workout supplements. Over 1300 grams of carbs in 4 days (yes I counted). All for 1 hour, 57 minutes, and 21 seconds of glory. Sweating so much you have clumps of salt stuck on your body might not sound glorious to some. Neither would dodging rockets of various body fluids flying from the facial orifices of your fellow runners. And neither would running past a man who smells like he may have opted to skip the port-a-potty lines so as not to ruin his finish time. But to me, all of that spells GLORY. I had envisioned finishing the run in one of two ways. In the first way, I injure myself about half way through the run but think “no, think of all the work you’ve put into this…you’ve got to keep going!” so I limp the last 10km before I collapse at the finish line in the pouring rain. In the second way, I dash across the finish line and triumphantly rip my shirt off, revealing a set of washboard abs as I wipe the sweat off my face with my shirt. Not surprisingly, neither of which happened. Nope, instead I chugged along at a somewhat comfortable pace until I reached the last kilometer marker, and then ran as fast as I could (which wasn’t very fast) to the finish line. I felt weird and dazed but managed to keep enough sense in me to know that I should not stop moving. I grabbed my medal and one of the bags of food that was being handed out and went to find my family. No drama. Just a lot of exhaustion, but even more pride. It was a much different experience than any of my training runs, obviously. I found it hard to keep myself at a steady pace at the start due to the energy of the thousands of people around me. I had planned on incorporating sprints into each mile just like I had while I was training, but my pace was faster than normal so I only threw a couple rounds in here and there. I found my energy starting to waver earlier than it had on any training runs, which I’m guessing was due to the faster pace as well as the mix of emotions I experienced before and during the run. Heading to the race and waiting at the starting line I went from being so nervous my hands were shaking to being totally calm numerous times, and I could feel the adrenaline coursing through my body. I met my tattoo twin around mile 5 and we exchanged “Namaste”‘s with one another before settling back into our own worlds, and I had to choke back tears watching a blind man being led through the course with a rope by his friend. None of that happened on my little Thursday morning runs on my own. I don’t think it made much of an impact. Like I said, I fatigued earlier than usual, but I think that was from running faster. I also had used Gu endurance gels during my training runs, and for Sunday I decided to try out Vega’s gels. I know, I know. Never try anything new on race day. But I figured that since all of Vega’s other products have treated me so well, so would the gels! There were so many factors that contributed to the difference of this run from any of my training runs so it’s tough to pinpoint what exactly contributed to my success and what hindered it, but as much as I hate to admit this, I think the Vega gels didn’t treat me as well as I had hoped. After taking a Gu I feel an immediate burst of energy. With Vega…not so much. I really wanted to like Vega. It’s date-based and contains all natural ingredients whereas Gu is mainly maltodextrin. My theory is that all the processing the simple carbs in Gu go through makes them more easily absorbed. I don’t really know, I’m clearly not a scientist. But I think from now on I’ll be sticking to Gu for my long runs. Plus they have peanut butter flavour, and who doesn’t want a shot of PB half way through a 21km run? Sorry Vega, you still hold the place in my heart for all my other sports supplements. As I had somewhat predicted before my run, the carb load didn’t really help me out, but it didn’t set me back either, aside from gaining a few pounds. 😐 I didn’t consume nearly enough carbohydrates to qualify those few days before the run as true carb loading days, and I still continued to work out. And to be totally honest, I wouldn’t even really consider the carb load fun. Sure, it was great eating all those bagels and rice and fruit and jam. But I also felt pretty gross and was constantly stressing about eating enough carbs and not eating too much protein or fat. And I missed peanut butter! I think that for my next half I’ll skip the carb loading and just make sure to eat enough complex carbs in the few days leading up. During training I definitely noticed a difference between the runs where I consumed an adequate amount of carbs the day before and the runs where I didn’t. So what’s next? I don’t really have a plan at the moment, which is kind of liberating but moreso scary. I’m a bit of a control freak that always needs to have a plan in my life, so I think I’m going to try to step out of my comfort zone and just wing my workouts for the next few weeks. 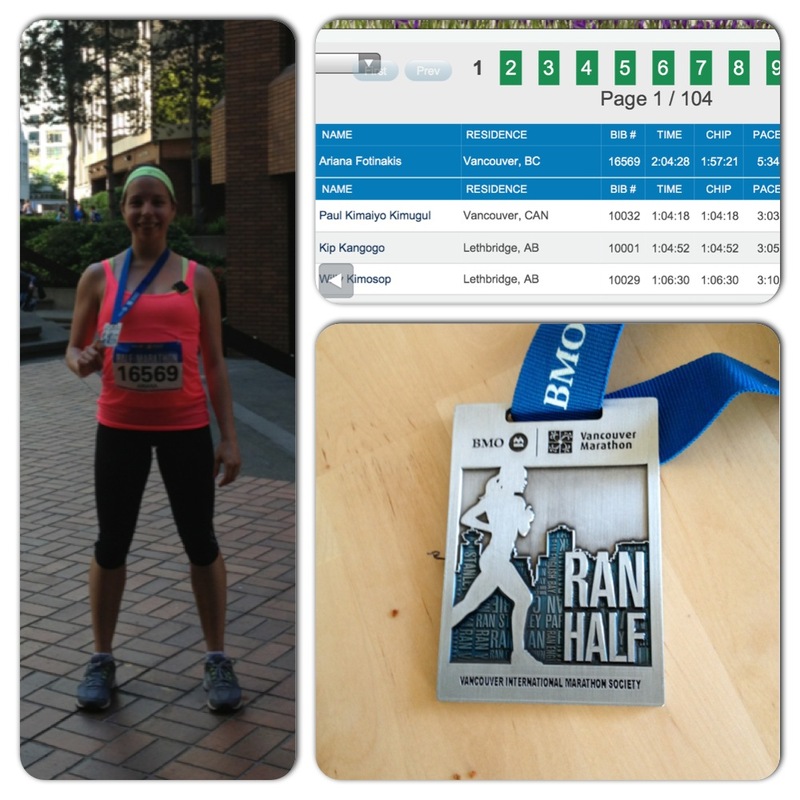 I’m running the Lululemon Seawheeze 1/2 Marathon in August so I’ll start my training in about a month. I was pretty happy with the training plan I developed so I think I’ll stick with that again, although I may incorporate a few hill drills just for fun 😀 I’ll be making up some strength training routines over the next couple weeks, so if I come up with any good ones I’ll share them on here for sure! If there’s anything in particular you’d like to learn about or would like me to write about let me know! I’m open to suggestions. And to all the runners out there, do you have any specific training tactics or preparation rituals when it comes to races? I’d love to hear about them! This entry was posted in Fitness, Running and tagged carb loading, exercise, fitness, goals, half marathon, health, races, running, supplements, training. Bookmark the permalink.